By Ishaan Tharoor. November 13, 2015. The Washington Post. 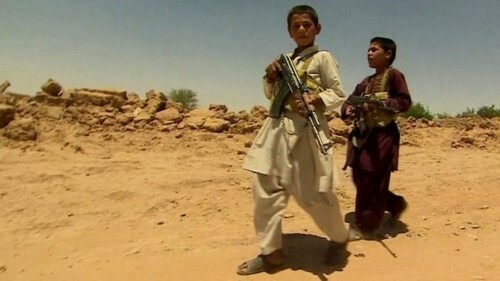 Afghan child soldiers are recruited to fight the Taliban in Iraq. The following is a list compiled by Ishaan Tharoor, referencing a report by Kevin Sieff – ‘South Sudan thought it solved its child soldier problem. It hasn’t, appeared in The Washington Post. In recent years, Burma, also known as Myanmar, has undergone important political reforms and staged elections this week that appeared to show the victory of the country’s main opposition, pro-democracy party. But its many years of repressive military rule have left a toxic legacy: the presence of child soldiers in the ranks of both the national army as well as a constellation of ethnic militias in various parts of the country. Hundreds have been freed in the past decade in the wake of international pressure. The Islamist militant group Boko Haram has abducted children into its ranks, and forced some to bear arms. The succession of armed conflicts to torment the Democratic Republic of Congo include myriad cases of child soldiers being drafted into the ranks of both government forces and a constellation of rebel groups. As Sieff reports, some 16,000 children have been recruited by both government and rebel forces since hostilities flared in late 2013. “They are foot soldiers and cooks and cleaners, boys and girls as young as 9. Many were taken from their homes and schools and forced onto the battlefield,” Sieff writes. Syria’s miserable disintegration — the country is now in the fifth year of a grinding civil war — has displaced half the Syrian population and led to a hodgepodge of militant factions carving out fiefdoms within the unraveling state. The jihadist Islamic State has released propaganda videos and photos of its young recruits, including hideous images of children as parties to hideous slaughters. They are not alone, though: a recent Human Rights Watch report accused Syrian Kurdish factions, erstwhile allies of the United States, of also sending children to war. War-torn Somalia has endured decades of conflict and currently is still in the midst of a long-running battle pitting government and African Union forces against al-Shabab, an Islamist group with ties to al-Qaeda. Both the extremist group and the government have been accused by the U.N. of recruiting child soldiers. Last year, the U.N.’s top envoy for children and armed conflict found that former child soldiers rescued from al-Shabab were being “punished” in camps intended for their rehabilitation. In Sudan’s war-ravaged Darfur region, there are myriad reports and eyewitness accounts of child soldiers participating in alleged war crimes and massacres of civilians.